A Woman of Affairs was technically based on the novel “The Green Hat” but due to censorship, the story was changed so much it apparently bared little resemblance (kind of makes me wonder if the book might be due for a new adaptation). Cast: John Gilbert, Greta Garbo, Lewis Stone, John Mack Brown, Douglas Fairbanks Jr.
After losing the man of her dreams, Neville Holderness (JOHN GILBERT), due to the meddling of his disapproving father (HOBART BOSWORTH), Diana Merrick (GRETA GARBO) reluctantly weds another admirer, David Furness (John Mack Brown), whom her brother (DOUGLAS FAIRBANKS JR.) idolizes. David harbors a most dishonorable secret, which leads to his suicide on their wedding night. Sacrificing her reputation to save David’s honor, Diana’s free-spirited lifestyle is deemed the unofficial cause of his death and she is banished from “good society.” Thus chastised, Diana decides to live up to her reputation and ventures on a series of “foreign affairs,” amorously globe hopping with dignitaries from London to Cairo. Diana is at last reunited with her one true love – only to learn of his recent engagement. 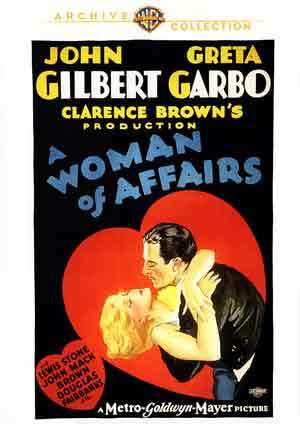 This black and white presentation of A Woman of Affairs is pretty much standard for the Warner Archive DVD-R releases, meaning there’s been no restoration done so you will get a permeation of major scratches, dust and dirt on the film, but when you consider the film’s age, now 90 years old, it actually doesn’t look half bad. Being a silent film, the Dolby Digital Mono track outputs the orchestral music with okay clarity, though nothing terribly exciting. Overall, A Woman of Affairs was technically based on the novel “The Green Hat” but due to censorship, the story was changed so much it apparently bared little resemblance (kind of makes me wonder if the book might be due for a new adaptation). This release from Warner’s Archive Collection offers up acceptable video and audio transfers but that’s about it, with no bonus material, per the norm.